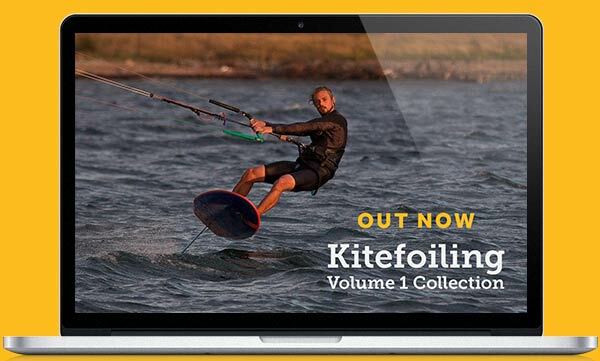 UPDATE: Our new Kitesurfing Volume 1 Collection has been released and is available to purchase now in the Progression Player App – everything you need to learn from waterstart through to connecting multiple turns on a wave. 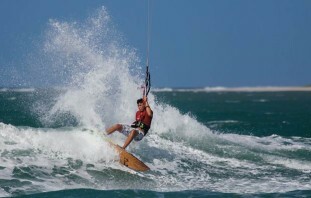 Particularly if you are riding strapless, make it easy on yourself and forget about the waves. Get the Basics sorted. Yes, we all want to jump in and get that sick bottom turn but in reality, it may just be a let down if you haven’t got your board and kite skills in sync! On twintips, we drive hard off our back foot but on a surfboard, our weight is more balanced and if anything your will need to over compensate and keep more weight on your front foot. This is particularly noticeable for anyone riding strapless. And even more so if you haven’t really surfed (without a kite), your tendency when bottom turning and then carving across the face will be driving off that back foot. It’s the easy option and maybe satisfying in smaller waves for a one wave hit. but if you want to join together multiple top to bottom turns, maintain control and open yourself up to variations down the road, from the start focus on both your feet. It’s a humbling experience, especially in larger waves but it will help your board skills improve rapidly. And you will very quickly realise if your weight distribution, between your feet, is off! 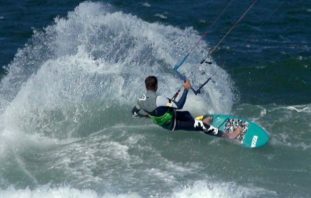 I don’t think it will come as a shock to anyone that perfecting your carving turns is going to be essential for your kite surfing enjoyment. Whether it’s carving a turn at the bottom of a wave, making a speedy carve to pick up a swell or the kick out when you need to escape that closing out section before you get washed up on the rocks. You need 99.9% hit rate so practice practice practice. It’s another perfect opportunity for those flat water days. Experiment! Both when cruising, or riding a wave, don’t allow your back foot to be stuck in the same spot. An inch movement back or closer to the rail can have a big effect. Even cruising, try moving your back foot further forward to help you get upwind easier. This may well be a contentious issue. For twintips, I’d agree leashes are not necessary for 99.9% of people. But with a surfboard, particularly whilst learning, there are times when it can help, particularly if you are pushing yourself to try something new! If you’ve got footstraps, there are little advantages as you can push yourself hard when riding waves, jump over white water and keep your board close. 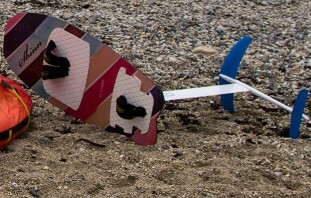 Strapless when first learning in flat water or small waves. Allow yourself to crash and not worry about the board. Strapless in medium to large waves, particularly if it’s not a beach break, it’s no fun having your board washed up on rocks! If you are wearing a leash then you need to ensure that every time you are off your board your aware of where your board is. Is your board between you and breaking waves? If you ping off into the air, is there tension in my leash? Be prepared for that tension to suddenly disappear – protect your head! And one final suggestion, get the lightest weight leash then at least it will snap before the biggest of elastic spring backs! Anyone got any good tips for newbie’s starting out with a surfboard for the first time?